Understanding which winged insect you are dealing with is a good start, as it enables us to get to the root of the problem much quicker. While species are vast and varied, below are the ones which we come across the most often. Grey thorax with four dark stripes running lengthways along the body. Sides of abdomen are yellowish and may be transparent. A dark band covers the final abdomen section. Kitchens, waste disposal areas, drainage gulley’s, roof gutters and bird droppings. 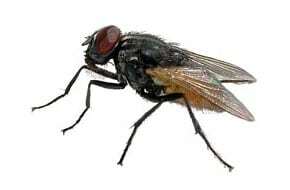 Adult fly feeds on liquid or semi liquid material (faeces, human food, food waste) that has been softened by saliva. Carry numerous pathogens – Typhoid, Cholera and Salmonellosis to name but a few! 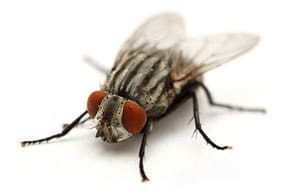 They land constantly in comparison to the Lesser House Fly. Female lays approx. 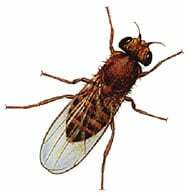 100 eggs at a time and 500 over her lifetime – adult fly lives for 2-4 weeks but can hibernate over winter. Stringent hygiene measures internally and externally. Fly screens on windows and doors. Ultra violet fly control units. Space treatment with insecticidal fog and/or localised treatment of breeding/alighting sites with residual insecticides. Grey thorax with three indistinct stripes running lengthways up the body. Its abdomen has extensive areas of yellow at the base. In buildings, circling near the centre of rooms. They take short breaks at night and rest on lamps/horizontal surfaces. Leave excrement marks on resting surfaces. Female lays up to 2000 eggs – total life span 2-3 weeks. 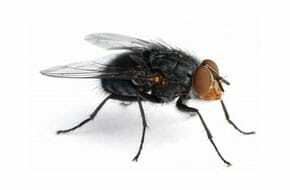 Fly screens on windows and doors, Stringent hygiene internally and externally. 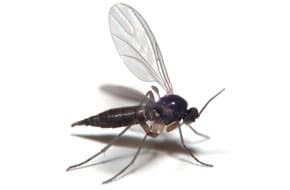 Ultra violet fly units will have limited results with this species of fly. Space treatments with insecticidal fog and/or treatment of alighting surfaces with residual insecticide. Attracted to rotting flesh – they seek out carcasses, commonly birds, rodents and other small mammals. Will also feed on animal and human excrement. Will sense a corpse from up to 1km away – move in to lay eggs on the corpse within minutes of death. Female lays eggs in batches of 200 – and will lay up to 2000 in her lifetime of 4-5 weeks. 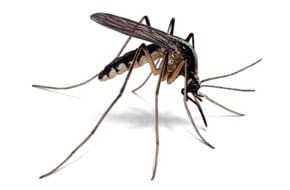 Find and remove breeding site (carcass), Treat breeding site with residual insecticide, Fly screens on windows and doors, ultra violet fly control units. Large fly with wingspan up to 20mm. Distinctive dark/grey/olive coloured thorax covered in golden hairs. Likely found in loft spaces and upper floors of southerly facing buildings. Parasitic in Earthworms – do not lay eggs on human food – not a health hazard – enter houses to hibernate in late Autumn – gather in loft spaces or wall cavities. Female lays eggs in soil – eggs hatch and larvae burrow into earthworms. Space treatment of roof void with insecticidal fog and vacuum up dead flies, or install ultra violet fly control machines with catch trays removed (in loft spaces). Proofing against this species is almost impossible. Small insect with a wingspan of 14-15mm. Black head, thorax and abdomen. Thorax has humped appearance. In overwatered pot plants in homes and workplaces. Feed on plant roots and fungi/mould. Very hardy fly – can survive freezing. Re-pot plants and feed/water from the base only – sometimes a local insecticide can be applied to the soil that plants are in. Drains, kitchens, bars and food production areas, where hygiene is an issue. 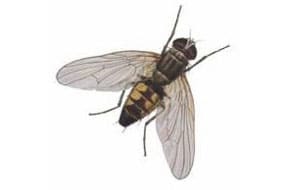 Jerky, short bursts of running, characteristic to the adult fly, hence the name Scuttle Fly. 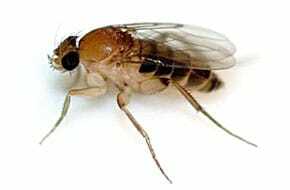 The fruit fly has a tan thorax and its abdomen is black on top and grey underneath. Its eyes are red or dark. Fruit flies often infest homes with ripe, rotting, or decayed fruit and produce. They also enjoy fermented items such as beer, spirits and wine. Fruit flies might also breed and develop in drains, waste disposals, bins and mop buckets. Feed on rotting or decayed foods. Once they begin reproducing indoors, females are able to lay about 500 eggs and the eggs will hatch in as little as 24-30 hours after being deposited by the female. This makes the pests difficult to control. Regularly wipe surfaces, clean spills and empty your bins to help prevent fruit fly infestations. If you already have an infestation, it is important to identify the source, rid any fermenting waste and then take additional control methods. Slender long-legged insect with forward-pointing, piercing and sucking mouthparts. Wingspan 7-15mm. In pools of stagnant water or in blocked gutters and drains. Parasitic – feed on mammalian blood – important vectors of disease. Remove breeding sites and treat areas with residual insecticides. Screens on windows and doors. Ultra violet Fly Control units. Black head and thorax with black and yellow patterning on abdomen. The vast majority of wasps are solitary insects, however the nuisance species in the UK (Vespa Vulgaris) is a social wasp and form nests with large numbers. 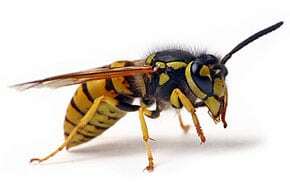 A serious pest in late summer when worker wasps search for sugary foods. Stings can cause anaphylactic shock. Black with a dirty/golden yellow collar near the head and one on the abdomen. The queen’s tail is an off white/buff colour which can sometimes appear orange. The workers have a white tail with a subtle buff line. Widespread, often found in grassland, woodland, towns and gardens but generally absent from upland areas and particularly moorland. 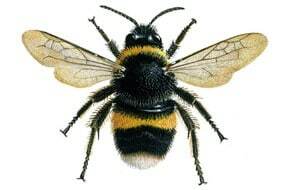 Bumble Bees do not swarm and are not aggressive. Only females can sting and they will only do so if severely provoked. They mostly nest in disused rodent burrows and occasionally compost heaps in gardens. The Queen emerges in Spring, searches for pollen rich flowers/crops, lays eggs and builds a colony of up to 400 bees. Most of these are females, males only appear towards the end of the season for mating purposes. Leave alone if at all possible. If causing a human hazard these bees can be killed with insecticides but control is not easy due to the structure of their colonies. Smaller and slim appearance, more like a wasp. Usually oval-shaped creatures with golden-yellow colors and brown/black bands. Honey bees will swarm to find a new home and when they do they are generally in a good mood as they have gorged themselves on honey! Don’t panic, and leave them alone. If they are causing a nuisance or a safety hazard, the police hold contact details of Beekeepers who can remove the swarm. Honey bees are the highest form of insect life and live in a well organised colony. Typical population is 40,000 bees. The honey is produced and stored in a wax comb to feed the grubs. One queen lays all the eggs and the sterile female workers go out and gather the pollen to feed the queen. The sterile females outnumber the fertile males (drones) normally tenfold. 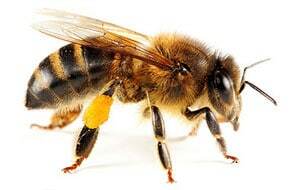 Whilst Honey Bees are NOT protected we strongly advise that they are left alone. They are very beneficial insects and are vital pollinators.